My name is Jocelyn Kaselow, but I go by Joci (Joss-ee). I started racing triathlons in 2014, so this will be my sixth season in the sport. I ran track in high school and the first two years of college, but I was a 100m hurdler, so the fact that the run leg of a “sprint” triathlon is a 5k makes the track sprinter in me laugh a little. 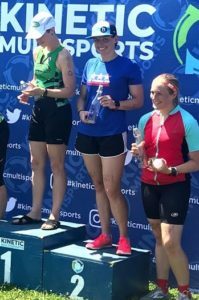 I have completed races up to the 70.3 distance, but my heart lies in the all-out effort of the sprint distance races, so sprints and olympics are my focus for this year. I also love a challenge, so several times in 2019 I will be racing double weekends (Oly on Saturday and Sprint on Sunday)! Duathlons also have my heart (mostly because I’m a slower swimmer, so why not just take that part out?) so I plan to throw in a couple of those at the end of the season. I will be on course this year smiling at as many people as I can in transition and on the run course! In addition to doing a ton of local races, I am on Team USA; I competed in the ITU Age Group Sprint Distance World Championships in Australia last year and am headed to Switzerland this year. A couple facts about my life outside of the multisport world, I am a civil engineer and construction manager; I was born and raised in northern New Jersey; I went to RPI for college and earned both my bachelors and masters degrees there; I have two adorable orange cats whom I adore; and I live in Silver Spring, Maryland.